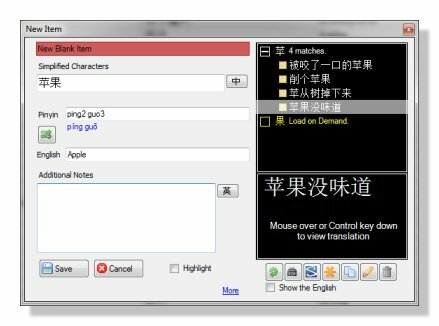 By typing in the English and Chinese. 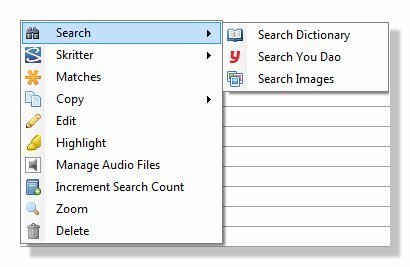 By choosing a result from the Dictionary Search. Tests English to Chinese and Chinese to English. 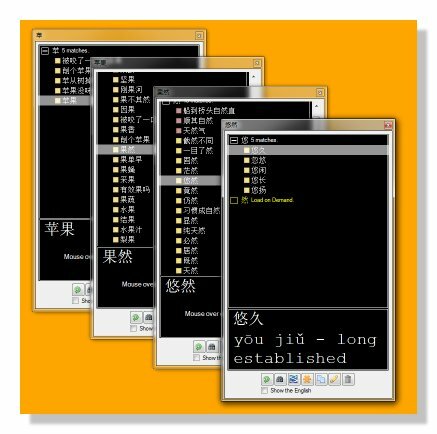 Includes the 100,000 + item community maintained and contually updated CC-CEDICT Chinese/English dictionary. Super fast XML based search. Add items to your test list with a single click. 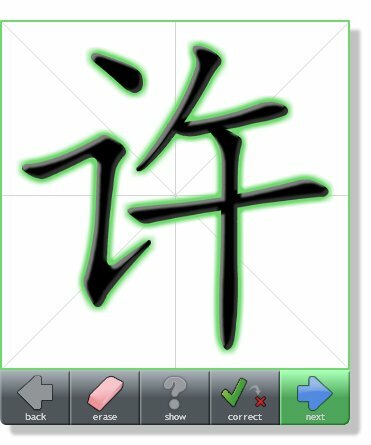 Search for characters, pinyin or English. Recursive search, Image search etc. Color-coded results show all matches. Roll your own updated dictionary whenever you like. Do you ever have to limit your reading because you are overwhelmed by new vocabularay? 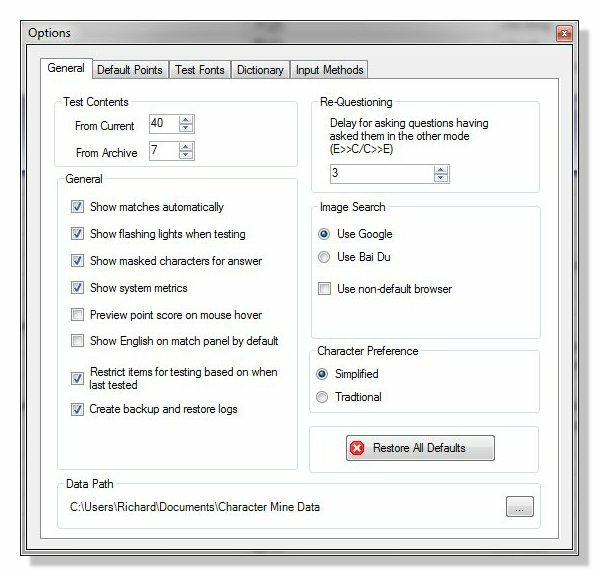 Character Mine keeps track of the number of times you search the dictionary for an item even if you don't add it to your test list. This way you can identify the high frequency vocabulary that is really worth memorizing. See how each item fits into your growing knowledge matrix. Available in every major screen of the program. Available on all program screens. 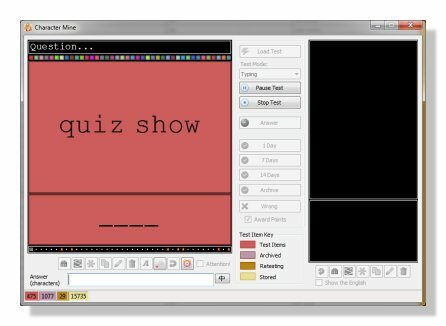 Send any characters straight to Skritter Scratchpad with a single click. Practise writing the character with your mouse or graphics tablet. Learn the correct stroke order for any character. Study the different elements that make up the character. 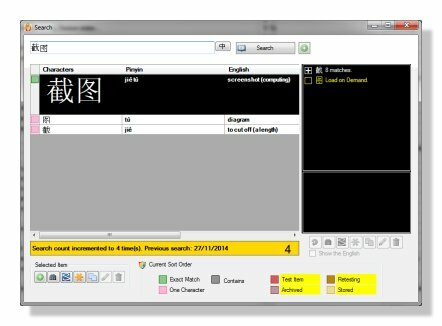 Fully master the character by adding it to your Skritter test lists. Make your character learning and your vocab building mutually reinforcing. 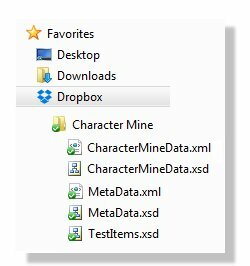 Change the default data folder to any folder on your network. Easily share data between your devices without hassle.